You likely already know that the internet is heavily censored in China. The country’s so-called Great Firewall prevents users from accessing a huge range of sites, apps and social media, but these restrictions can be bypassed with a Virtual Private Network (VPN). 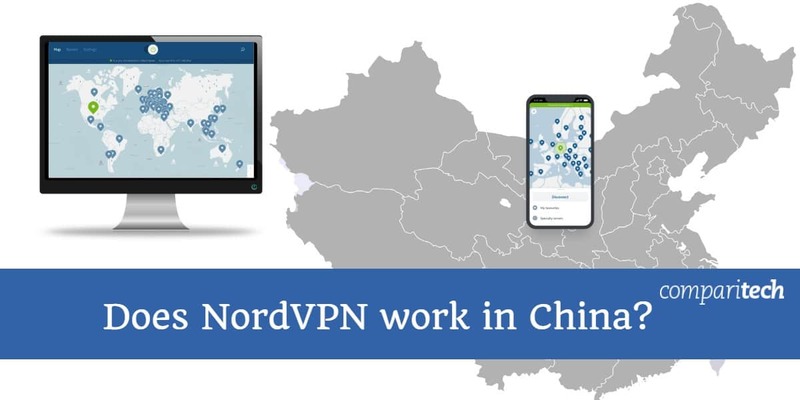 So does Nord VPN work in China? While most VPNs don’t work in China, there are a few, including NordVPN, that do. We’ll cover China’s restrictions in greater detail, and explain how to use NordVPN in China including an important tip for iPhone users. Most countries employ some form of blocking to restrict access to sites hosting illegal material. The problem is that China has far more stringent restrictions than most places. It blocks highly popular sites like Facebook, Wikipedia, Twitter, Google (including Google Docs and Drive), and YouTube. This makes it difficult for travelers to stay in touch with their friends back home, but also cuts off the supply of neutral information about the country, and makes it difficult to work as part of an international team. You can bypass these restrictions and access the internet as normal, however, by connecting to a VPN. These encrypt your traffic and route it through servers elsewhere in the world. This not only allows you to bypass Chinese internet censorship entirely, it also prevents your Internet Service Provider (ISP) and the government from monitoring your activities. NordVPN is one of the few VPN services that works reliably in China. There are a couple of tricks it uses to evade detection: first, it doesn’t offer any servers in China itself. This means that NordVPN doesn’t have to comply with China’s complex data retention legislation and removes the risk of government interference with the service’s hardware. Second, NordVPN offers “obfuscated servers.” These are specially designed for use in countries with heavily-restricted internet access. NordVPN is understandably hesitant to explain how these servers bypass state-imposed restrictions. However, it likely involves disguising a user’s traffic to more closely resemble regular HTTPS activity. The main NordVPN website is currently unavailable in China. Customer support can direct you to a working mirror site (which is just a copy of the main website, accessible from a different URL). 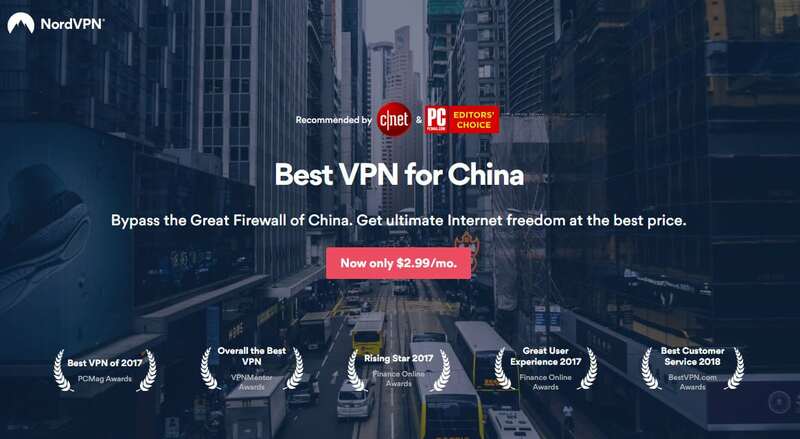 It’s worth noting, however, that these can be taken offline at a moment’s notice, so the best course of action is to register and install NordVPN before you arrive in China. iOS users can still use the service in China by manually setting up an IKEv2 connection but the easiest way to get connected on Windows, Linux, MacOS, and Android is to use an obfuscated server. To enable these, open your NordVPN app and click the Settings option in the top-left. Next, scroll to the bottom of the list and click Show advanced settings. You’ll see a warning, but just click on the I know what I am doing button. Now, find Obfuscated Servers in the list and click the toggle button to enable them. If you return to the app’s home screen, you should see an Obfuscated Servers option at the top of the list on the left-hand side. Clicking it will automatically connect you to the best server, but you can also choose one from a specific country by clicking on the three-dot icon to the right. Once connected, you’re free to browse the internet as you normally would. If your chosen server doesn’t work, we’d recommend trying one in a different location. If you’re still having trouble, customer support should be able to help, either by specifying a server which still works, or providing instructions for configuring your device for using obfuscated servers. Support is available 24/7 over live chat, and if they can’t solve your problem, you can take advantage of NordVPN’s 30-day money-back guarantee to claim a full refund. Why does China block certain websites? Ostensibly, China’s internet restrictions are in place to protect its citizens from harmful materials or ideologies. However, these restrictions have frequently grown in scope, with a particular emphasis on censoring news or opinions that cast the Communist Party of China in an unfavorable light. Specifically, section five of the Computer Information Network and Internet Security, Protection, and Management Regulations ordinance (1997) makes it a crime to use the internet to tell lies, distort the truth, spread rumors, or “injure the reputation of state organs.” The problem here is that this wording appears to be intentionally vague: it does not specify that any type of rumours are exempt, for instance, meaning that everyone from journalists to celebrity gossip publishers run the risk of prosecution. What sites and services are blocked? As some VPNs allow you to bypass China’s Great Firewall, the Chinese government has put a major emphasis on restricting access. Further, they even block basic information about how a VPN works. Many VPN providers lack the time and resources required to find a workaround. This means that the list of VPNs that work in China grows shorter all the time. Currently, there are only a handful of services (other than NordVPN) that can reliably connect: ExpressVPN, Ivacy, StrongVPN, and VyprVPN are some examples. It’s important to note that all of these service’s websites are blocked in China, however. Some services have official mirror sites set up to allow you access when in China, this isn’t guaranteed. As such, we strongly recommend registering with a VPN provider and installing the software before visiting the country. Are VPNs safe to use in China? Although VPN usage is heavily restricted in China, it hasn’t been banned outright. After all, businesses use VPNs all the time so international employees can securely access a shared intranet. However, China only allows businesses to use approved VPNs. As a result, VPN apps can’t just be downloaded from stores like elsewhere in the world. China’s VPN laws are extremely complex and user experiences vary from one person to another. We strongly advise familiarizing yourself with the pertinent legislation before attempting to use a VPN when in China. My VPN’s website is inaccessible — what should I do? If you’re in China already, there isn’t much you can do if your VPN’s site is suddenly blocked. As such, it’s better to be proactive: before you arrive in China, we recommend making a note of alternative URLs, support email addresses, and manual connection processes for your device. Think about how you’ll store this information. If your VPN goes down unexpectedly, you won’t be able to access cloud storage services or messaging sites. Ideally, relevant information would be kept in a locally-stored, encrypted file on a password-protected device. How do I check if a site is blocked or not? If you’re heading to China soon and are unsure if a particular website will be accessible, you can use our Great Firewall tool to check in advance. However, the list of blocked websites updates frequently. As such, there’s no guarantee a given site will still be available when you arrive. 1 Does NordVPN work in China? 2 How does NordVPN bypass China’s Great Firewall? 4 Why does China block certain websites? 5 What sites and services are blocked? 6 Do any other VPNs work in China? 7.1 Are VPNs safe to use in China? 7.2 My VPN’s website is inaccessible — what should I do? 7.3 How do I check if a site is blocked or not?